Music may have been the first media format to be upended by digital, but more than 15 years later, it's the only one still fixated on what was, not what can be. If the industry hopes to restore growth, both labels and artists will need to confront the changes brought about by the likes of iTunes and Spotify. Only then can a path forward be charted. The disruption of the music industry has undoubtedly benefited consumers, but for many on the inside, its consequences have been both profound and painful. Artists finally have direct connections to their audiences, but they must fight through more noise than ever before. Distribution is no longer constrained by shelf space or A&R men, but a stream or download generates royalties many artists decry as untenable. Audiences can now enjoy more music, more easily and in more places – yet the amount they spend is at an unprecedented low. Music may have been the first media format to be upended by digital, but it remains deeply challenged even as video, publishing and gaming continue their path forward (however modestly). If the industry hopes to restore growth and fix the problems with today’s streaming models, it needs to confront its evolution: how have ecosystem revenues – from albums sales to concerts, radio plays, digital downloads and streams – changed and been redistributed? What is the underlying value of music? Did streaming erode this value or correct it? What’s the logic behind streaming royalty models and where are its flaws and decencies? How can it be improved? After 15 years of declining consumer spend, it’s time to stop focusing on what was or “should” be. Industries don’t rebuild themselves. 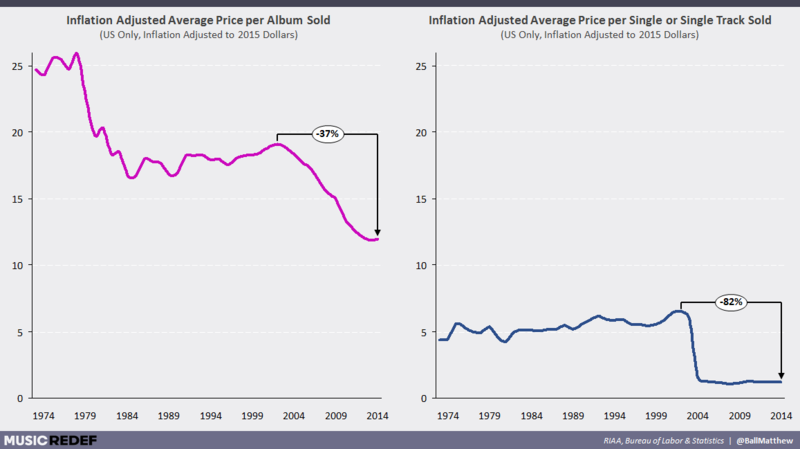 Since the RIAA began its comprehensive database of US music sales in 1973, the category has never commanded less in consumer spend than it does today. On an inflation-adjusted basis, sales have plummeted by over 70% (or $14B) since 1999 – even though the American population has grown by some 46M over the period. And this decline is likely to continue. Digital revenues have begun to fall and CDs, which still represent 30% of sales, are unlikely to rebound. In Q3 of 2014, Wal-Mart, which moves one in every four physical discs sold in the United States, nearly halved the shelf space dedicated to the format, as well as the number of unique records it carried. In a few years, Amazon may be the only mass market retailer of physical music, at which point prices will undoubtedly tumble further. 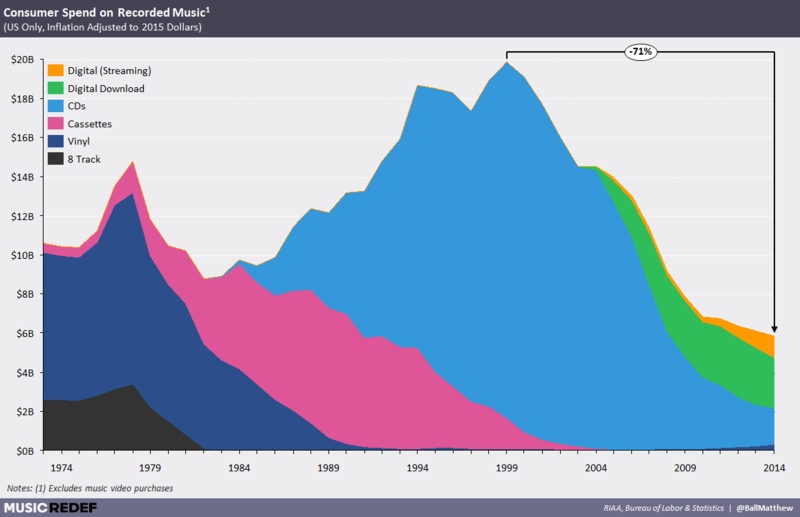 What makes this decline particularly controversial is the fact that consumption of recorded music is greater than ever before. We listen to it wherever we go: on the subway, waiting in line, getting groceries and anywhere else we can. The soundtracks of our lives, so to speak, rarely stop. As a result, music executives often blame the collapse of revenues on iTunes’ 99¢ price points (and claim that the associated deal they struck with Apple arose only out of the extraordinary paranoia and confusion surrounding digital distribution and piracy in the early 2000s). However, much of the industry’s pre-iTunes value was inflated, held up only by bundle-based packaging (viz. albums), rather than consumer demand. Per track prices mattered, of course, but they’re also a distraction. The introduction of true à la carte music purchasing was bound to disrupt the music business. Everyone knew the album model had forced consumers to “own” tracks they didn’t want and prevented them from owning some of those they did, but how this would net out was impossible to predict. Nearly 15 years later, however, the answer has become clear. 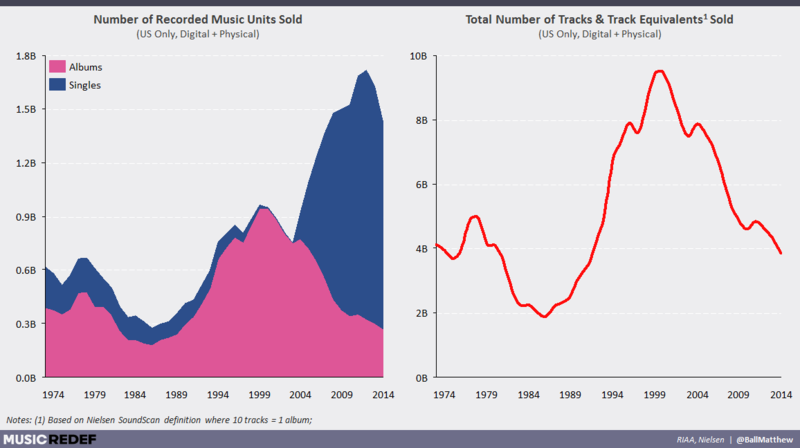 By 2010, the total number of tracks (including album track equivalents) sold in the United States each year had fallen by 57% (to roughly 4.6B). Though it’s convenient to blame piracy, NPD estimates that fewer than 340M tracks were pirated in the United States in 2010 (~17M pirates downloading an average of 20 tracks each). Even if every one of these illegal downloads represented a cannibalized sale, the industry would still be down more than 50%. The same is true if the number of pirated tracks were somehow twice as many as NPD had estimated. With fewer than 1.5M Americans subscribed to music streaming services in 2010, this explanation also falls short. The end of the album didn’t just bring about the end of unearned revenues, it revealed that the underlying demand for “owned” music was much lower than most believed. Recognizing this fact is critical. If the music industry hopes to increase sales and better support its artists, revenues will need to be generated outside of conventional unit sales. But first, it’s also important to note that the album-to-track conversion has been doubly bad for the most popular artists. In the album days, consumer spend was monopolized by a handful of $20 “must have” records released by the Beatles and Michael Jacksons of the world. Today, that same spend (or what’s left of it) can be spread across dozens of artists – with each one compensated only for the specific tracks a consumer picks. As has been widely reported, declining unit sales led the music industry to refocus its efforts on concert revenues. 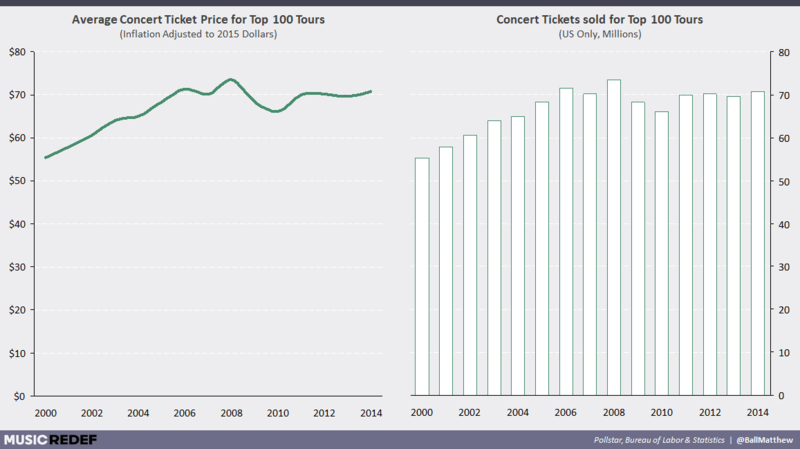 Artists now spend significantly more time touring than they did in the pre-Napster days (estimates here vary) and command close to 35% more per ticket on an inflation-adjusted basis. 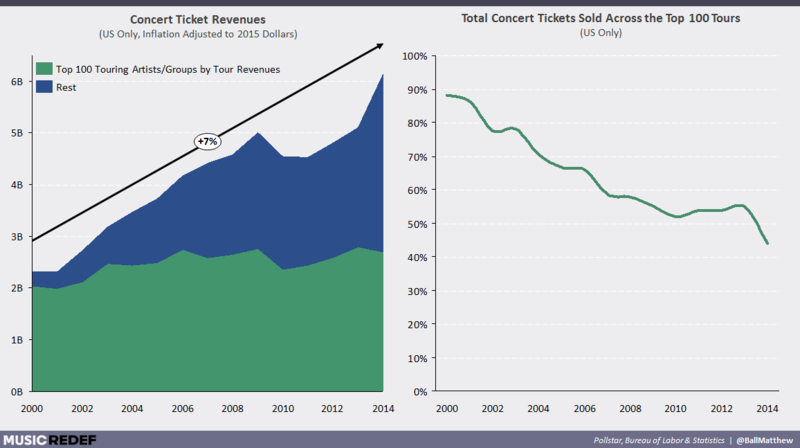 As a result, the US concert industry has nearly tripled since 1999 (when recorded music sales peaked). So in all, the pains and changes over the past 15 years have been unevenly distributed. The redistribution of music revenue is, itself, positive. Much has been said about the increasing diversity of society’s musical interests, but our tastes are not inherently more diverse than they were a century or even a decade ago. Rather, the average person simply couldn’t access nearly the variety that they can today. Even still, the drop in music revenues has affected everyone inside and around the business. What’s more, declining total track volumes explain only two thirds of the total drop in revenues. The rest, many artists decry, stems from the deliberate commoditization of music by those who have no respect for the craft or its artists – only a desire to serve up ads, build a digital empire or hawk hardware. This, they argue, is why revenues have collapsed and indeed, why Jay Z and a who’s-who of industry 1%ers banded together in March to try and forcibly re-value music through Tidal. To answer the questions of “value” and “fairness” – two particularly important concepts in the streaming music era – we need to understand how music supply, demand and monetization have evolved. As has typically been the case with popular media, the move to digital shows that much of the industry’s ”value” stemmed not from the content itself, but from distribution. In a digital environment, the majority of distribution expenses (CD manufacturing, pressing and packaging, shipping, physical retail etc.) are reduced or eliminated, resulting in a significantly lower cost per unit of music sold. However, as any company that still includes an oil surcharge can attest, this change does not necessitate reduced prices. The value of music is, in theory, independent from its costs. In fact, one could argue that the ability to purchase individual tracks from a seemingly endless catalogue, at a moment’s notice – and then take these tracks anywhere – should have increased the value of music. Yet, the shift to digital resulted in a price drop far in excess of distribution-related cost takeout. 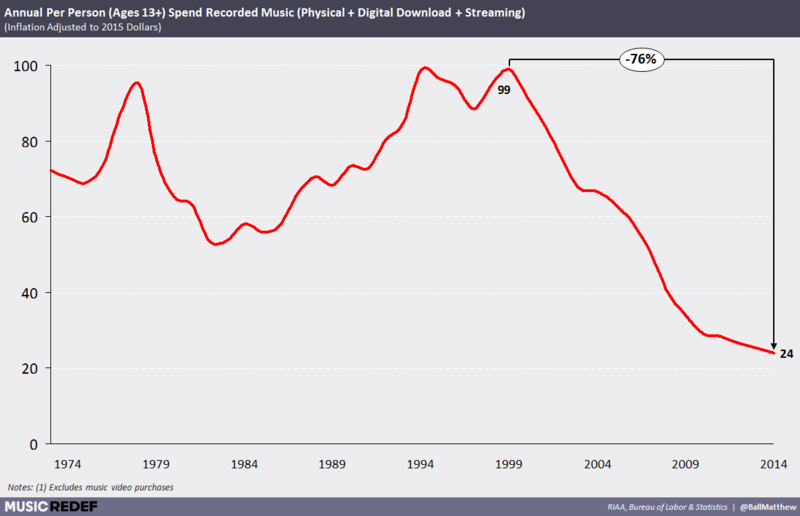 Piracy fears played a part, but the sustained drop in per track and per album value reflects a core economic reality: digital has made music more competitive than ever before. This is at the heart of the changing value. “Music is art, and art is important and rare,” Taylor Swift wrote in the Wall Street Journal in July of 2014 (months before pulling her catalogue from Spotify), “Important, rare things are valuable. Valuable things should be paid for.” Yet of all the mass media, music is perhaps the least rare, most substitutable and in many instances, the most imitable (just ask Max Martin or Dr. Luke). For nearly half a century, however, the major labels (and therefore their artists) have held a de facto monopoly on the music industry and its output – all by controlling distribution. The costs of recording, producing, distributing and marketing a studio album – not to mention getting a track played on national radio stations – were so significant that few could do so at scale without the major labels. Furthermore, the major labels had scale-related incentives that limited the number of artists they were willing to support. As a result, the supply of both artists and music was fundamentally constrained. Digital distribution ended this artificial scarcity, and with it the idea that music – even great music – was scarce. Spotify, for example, counts more than 30 million tracks, each available anywhere and anytime. Because of this, music lovers can now listen to a much greater variety of music – not just the few albums they’ve bought or what’s on locally programmed radio (which is heavily influenced by the major labels, too). This competition has inevitable economic consequences: prices go down and average units sold per album, track and artist drop. This is particularly true for online streaming. Though every music listener has favorite artists, consumption of music tends to be more passive and voluminous than any other media category. The average Spotify user, for example, listens to more than 1,300 tracks per month. When consumption is that great, the value of any one stream becomes slight. The economics bear this out: if we focus exclusively on Spotify paid subscribers ($9.99/month), the implied value of any one stream was $0.0076 in Q1 of 2015. These jaw-dropping per stream economics can’t be solved by eliminating free listening, doubling subscription fees (e.g. TIDAL HiFi) or even by increasing royalty rates to a full 100% of revenue. Would Aloe Blacc have been satisfied with $10,000 – not $4,000 – for his share of (post-label) songwriter royalties for 168M Spotify streams? Would $342.33 (instead of $114.11) for 4.2M Pandora streams have been enough for Bette Midler to “make a living”? While it’s hard for any artist to embrace these new economics, they can’t change the fact that the music industry has undergone a fundamental, structural shift in both supply and demand. As a result, the economics, business models and key industry metrics need to change. Preparing for the future will require artists and labels to better understand not just how and why music revenues have eroded, but also the mechanics of the streaming business and the ways in which economics are likely to evolve. Oddly enough, the best place to start is terrestrial radio. For all the attention paid to Internet distribution, broadcast radio and owned music still represent roughly 42 minutes of every hour spent listening to music in the United States. Though they’re unlikely to go away entirely, we will continue to see more and more of this time shift to services such as Pandora, YouTube and Spotify, which represent only 16% of listening time today (or 10 minutes of every hour). This transition is meaningful in a few ways. Most obviously, the topline economics vary tremendously across the different services and technology types, with digital distribution currently underperforming by 50-75%. In addition, value is both captured and distributed very differently by channel. Spotify relies almost exclusively on subscription fees and pays rights holders a royalty on revenue, for example, while broadcast radio stations depend almost exclusively on advertising, are free to the consumer and pay a blanket fee for music rights. It’s worth highlighting, too, that performers typically receive no compensation when their songs are played on AM/FM – only the writers and publishers do. The initial idea here, which is currently sustained by federal laws, was that broadcast radio provided performers with tremendous promotional value, which helped these artists sell records and concert tickets. Though writers and publishers benefited from the associated rights payments and/or royalties, regulators believed that radioplay value was overwhelmingly captured by the performers. As a result, the shift from AM/FM to satellite and web radio (both of which pay writers and publishers as well as performers) will have a profound effect on not only how much a “listen” or “play” generates in revenue, but who receives what portion of that revenue. Yet the real disruption will comes from the diminishing role of the medium when it comes to how music is discovered and made into a hit. Today, broadcast radio still drives an estimated 70% of music discovery, but this process is far from democratic. The majority of radio plays – especially for the biggest stations – originate from the promotional activities of the major labels. Though human-led curation is making a comeback online, most of the music discovered over the Internet comes from algorithmic recommendations, social sharing or independent bloggers – each of which is under significantly less influence from the major label system. Furthermore, the content listened to on on-demand streaming services is exclusively up to the user, not a disc jockey. Accordingly, the cannibalization of AM/FM listening by web streaming services will not only reduce the role of labels in the music value chain (and therefore the fees they deserve), but it will also limit the mass market “mindshare” currently monopolized by label-supported artists (as a group). However, the effects of government regulations go far beyond how revenue is passed through and whether performers receive a share. As the number of transmission types and interaction models have proliferated, the music industry has ended up with a labyrinthine set of regulations that, though designed to protect creatives, results in haywire compensation rates for the same core consumer service: audio entertainment. Until this is resolved, everyone involved in the music industry is likely to be frustrated by a sense of inconsistent and allegedly unfair treatment. Streaming is a particularly good example. As an “interactive on-demand streaming service”, Spotify (which primarily substitutes for music ownership, but cannibalizes radio time too) must form individual, voluntary deals with labels for the rights to their content and pays, by agreement, a 70% royalty on all revenues. “Non-interactive streaming services”, such as Pandora (which primarily substitutes for radio, but cannibalizes music ownership too), have content payments fixed by regulators and courts and use compulsory licenses to acquire content. In 2014, their content costs were only 48% of revenues and, unlike Spotify, can drop significantly as revenues scale. Even still, the on-demand future of music is becoming clear. Though Spotify had only a fifth of Pandora’s user base three years ago, it now challenges the company’s user count and nearly triples its total minutes delivered. Unlike Netflix (~10,000 titles) or Pandora (~1M tracks), the on-demand streaming value proposition is based on having all (or roughly all) the music a user might want. This has a defining effect on how rights holders are paid as individual services can’t acquire licenses to individual catalogues or titles at scale – it would be both contractually impractical and analytically infeasible. Netflix and Pandora, on the other hand, don’t need any specific content. They need titles that collectively optimize user engagement and retention relative to content spend. This doesn’t mean that certain artists and tracks aren’t more or less valuable to Spotify’s users, but comprehensiveness is paramount. As a result, Spotify establishes the “value” of every track in a consistent, straightforward fashion based on the share of total streams the track represents. If Drake’s music represents 10% of total plays in July, his tracks will receive 10% of total July royalties (which in turn represent 70% of Spotify’s total July revenue). Tidal and Apple Music (both launched seven years after Spotify) pay roughly 72%. Though this variability – not to mention the microscopic per stream payments (typically between $0.006 and $0.0084 according to Spotify) – will inevitably irk artists, this payout structure best reflects the “value” of music in an era of abundant supply. Any song “hired” to entertain is “worth” the same as another; the question for artists is how frequently will their track be hired relative to all other options? At first glance, focusing on the per stream royalty metric makes sense. The music industry has always spoken about the number of units sold or radio spins (though notably, not radio listens, which would be more appropriate per stream analogue), but it’s clearly unsuited to the consumption and distribution models of today. Not only is the figure inevitably low, it’s essentially impossible to decipher or compare. Spotify may pay the same flat rate to labels, but how these royalties are passed through to songwriters and performers varies tremendously from artists to artist and even album to album. The value of these post-label payments is similarly affected by the allocation of rights. A cheque from a stream of Kanye’s “All Day,” which credits 19 writers, will inevitably fall short of those to singer-songwriters like Hozier at the same stream counts. Similarly, the per track royalties cited by the members of a group or band will be but a fraction of those received by a solo artist. As a result, the total values reported by individuals are not only unique, they’re misleading. Of course, the distribution of royalties across credited writers, composers, performers and copyright holders isn’t new – but the public discussion of these values is. When is the last time an artist publicized her proceeds from a platinum record, 10,000 radio plays or 1,000,000 listens? In addition, the “units” discussed have moved from tangible, high-priced albums to intangible, variably valued streams, making the conversation particularly challenging for those outside the business. More broadly, Spotify’s royalty structure also requires artists to adapt to dramatically different compensation timelines and performance dependencies. When a consumer buys an album, the artists responsible would traditionally collect their total share of proceeds within the following months or quarters. Regardless of whether this album is played once, or becomes part of a daily routine for the better part of the decade, neither the amount paid by the consumer nor the amount received by the artists ever changes. And the revenue always comes up front and in a one-time payment. In a streaming environment, however, royalties are paid not only when (and to what extent) consumption occurs, but indefinitely. This has several consequences: (I) Even though streams, like unit sales, will be concentrated in the first weeks following a release, early payouts will be a fraction of what they used to be; (II) The financial success of an album may not be clear for several quarters or even years; (III) Records that drive sustained consumption can significantly out-earn those with more fleeting (or marketing-led) interest, even if the number of unique listeners (or those who would have previously bought an album) is identical. This change is particularly challenging for artists used to receiving big cheques for their hit albums, but it will also test those who feel their bank statement lags their newfound stardom. Accordingly, continued artist outcry is expected, even though the matching of revenue to engagement is hard to criticize. It’s worth noting, too, that Spotify’s 70% royalty model actually handicaps the company’s financial performance. “It’s unique in the media business”, Piper Jaffray analyst James March told Quartz earlier this year. “In every other media business I cover, if you sell more tickets, or get higher ratings, the operating leverage is massive, you don’t pay more [in licensing fees or royalties] for the TV show or movie. But in streaming music the more popular they get, the more royalties they pay.” Netflix, on the other hand, pays fixed fees for most of its content. Regardless of how much revenue the company generates (or doesn’t generate), the licensing costs stay flat – thereby creating the opportunity for outsized profits, as well as losses. The Spotify model is, by and large, good for the labels and their creatives. For every $10 subscription Spotify sells, the music industry will take home $7. 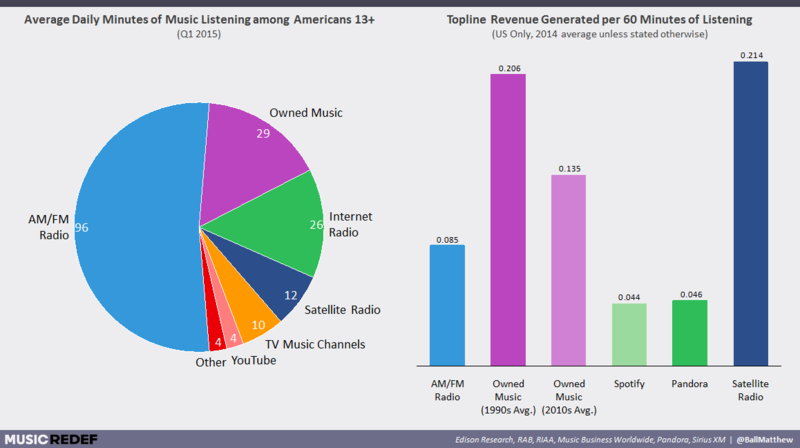 In general, Spotify pays 2.5-3x more of its revenue to the music industry than the AM/FM radio industry does. 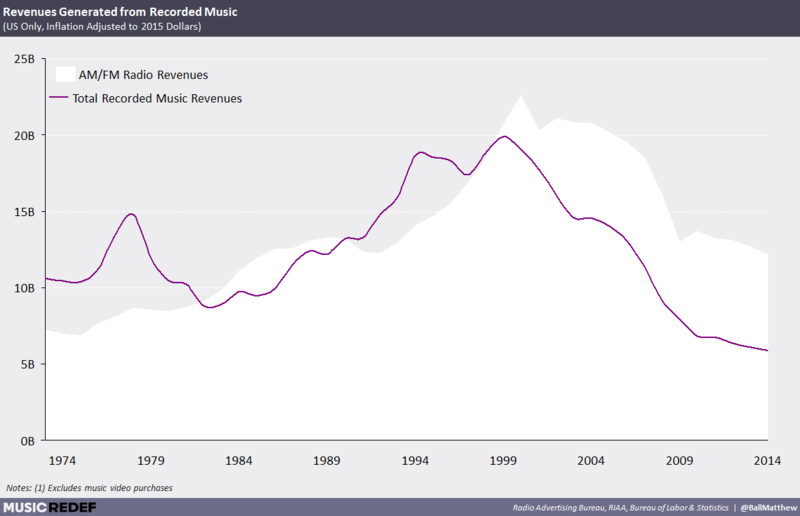 Though the latter is in decline, it still generates nearly $15 billion a year – twice that of the recorded music industry today. Revenue rates per hour are presently roughly 50% lower on Spotify than AM/FM radio, but this still generates more in net revenue to the music labels and is bound to improve as advertisers shift more of their spend online. Even still, Spotify’s revenue share and right-headed payments model doesn’t mean its offering is perfect. Spotify has long argued its free service (which includes commercials and disables track selection on mobile devices) is essential to converting users to a paid model. In addition, the company points out that generating ad revenue – however nominal – from non-paying users is better than these same listeners resorting to piracy. Yet while this underlying logic is true, its net economic effect is unclear. Though Spotify’s unpaid subscribers represented 76% of the company’s active user base in 2014, they contributed a mere 9% of total revenue. Moreover, the value of these users has fallen by a third since 2010 (after adjusting for currency variations), to only $3.8 a year or $0.32 a month. 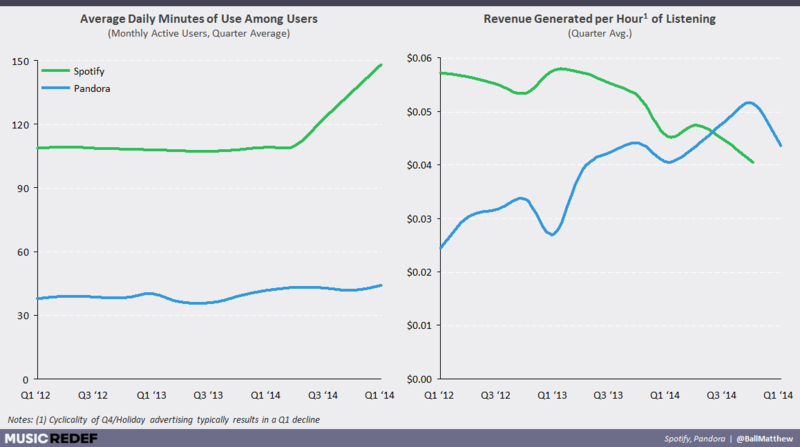 Today, a paid user is an astounding 30x more valuable than a free one – up from 20x in 2010. And this has profound implications. For every free user Spotify is able to push to paid, the company could lose 29 other free users and still generate more net revenue – for Spotify, as well as labels, performers and composers. If Spotify came out with changes to its free service (e.g. increased ad loads, listening caps, no track selection for desktop use, fewer advanced features etc.) that convinced only 3% (or 1.8M) of its free users to go to paid, the company and its stakeholder partners would realize immediate financial benefits – even if the remaining 97% (53.2M) of free users abandoned the service entirely. In isolation, a free user that generates ad revenue may be better than one that pirates. But if satisfying that user erodes the value proposition of a paid service – especially one worth 30x more per user – a net disservice may have been done to the industry. How many would-be paid users have been convinced that the free service is “good enough”? Is there no way to convince that user to pay without losing (literally) dozens of free users? Over the past few years, Spotify has continually reduced the gap between its tiers (listening caps were dropped in January of 2012, for example) and improved the free option (introducing new features available to both paid and unpaid users. As a result, Spotify’s revenue economics have eroded even as consumption (and therefore consumer value) increased and Pandora’s revenue per hour doubled. There are a few potential explanations for this divergence. As a substitute for radio, Pandora is logically an advertising-first service (four out of every five dollars in 2014 revenue came from ads). Accordingly, ad loads and sales are likely of primary importance. Similarly, revenue per hour theoretically scales with usage (another hour played is another hour with ads). On the other hand, Spotify’s reliance on fixed revenue (90% of grossings are from all-you-can-eat subscriptions) means that increased consumption will erode revenue per hour (just as is the case with Netflix or HBO), as well as payouts per stream. 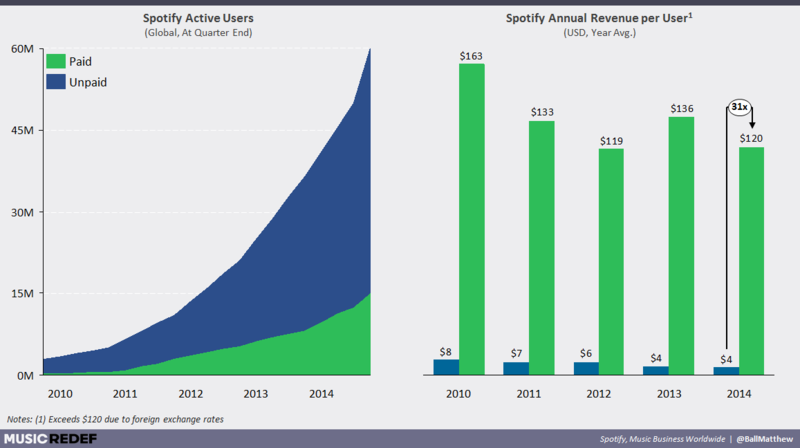 More broadly, revenue is likely of only secondary importance at Spotify when compared to growing Monthly Active Users. Not only are MAUs a key IPO metric (and therefore of primary concern to the company’s investors), but they enable Spotify to turn its service into a broader, more valuable entertainment platform (see its recent video announcement). In addition, a scaled user base helps the service insulate itself from existing competitors (Pandora) and ward off upstarts like Tidal, as well as giants like Apple and Google. These priorities and business model decisions are, rightly, Spotify’s prerogative. What’s more, the labels enter agreements with the company willfully, not through compulsory license. However, there are two potential problems here. First, the music industry is funding the majority of Spotify’s investment in user growth. When Spotify’s tiering strategy causes a subscriber to pick free service over a paid subscription, Spotify loses out on only $3 (or roughly $2 after tax), while the misses $7. While Apple Music (now) pays rights holders for music streams by users within their free three-month trial, Spotify simply works in free users’ streams into its artist payout calculation. They therefore get credit, but not paid. And the free usage never ends. Second, the ongoing availability of free-to-access music reiterates the idea that music is without value. It may not be worth what it used to be – or what artists wish it were – but it is worth something. And at only 32 cents per free user per month in ad revenue, B2B ad subsidization is far from enough. Even if free users listened to only a third as much music as paid users, per track revenue would be only $0.00044 (versus $0.0046 for paid, roughly 11x as much). With average per user consumption up 36% year over year (to 148 minutes a day), it’s clear that the service is valued by its users. And from increased value should come increased value capture. Spotify’s focus on users before revenue is typical with growth stage technology companies. And eventually, Spotify will need to shift from user acquisition to monetization – at which point having the largest possible user base is an obvious asset. To this end, Spotify claims that 80% of paid users start as free users – which could mean the company’s users-first strategy will ultimately be in the industry’s interest. A year’s subscription to Spotify costs $120. Though it seems pricey today (which is exactly the problem), the sum is largely in line with what used to be spent on an individual purchasing level. For more than three decades, the average American over 13 spent more than $75 a year on recorded music – and received significantly less than Spotify offers today. At times, including much of the 1990s, the average spend was over $90. Today, however, such spend is far outside the norm – and more so each day. In 2014, the same demographic group’s spend (which includes streaming services) was only $24 – a 76% drop from 1999. At its current rate of decline (-7% CAGR over the past 5 years), this figure will drop below $20 in two years. At what point are the strategic advantages of a scaled user base offset by accrued losses in consumer willingness to pay? Not only is it notoriously hard to change the perceived value of a product or service, even the most successful efforts will take time. This does not mean unpaid subscriptions should be dropped entirely. The logic behind maximizing the number of music listeners also makes sense – it’s the best way to drive paid subscriptions and generate revenue from those who might otherwise pirate. However, Spotify should begin to move some of its more differentiating features, such as synchronized running, to its premium tier, increase the frequency of advertising (which hits only non-paying subscribers) and re-introduce listening caps that will force heavy users to pay for unlimited service. Alternatively, record companies and publishers could pressure Spotify to reconsider its focus on user maximization at the expense of revenue optimization by adjusting contract terms. As long as the service incurs no material costs for free subscribers (only a royalty on incremental revenue and server costs), it has a reduced incentive to drive paid adoption or maximize royalty payments. To correct this, labels could require fixed payouts per unpaid subscriber on either a per-stream or per month basis. So far, we’ve discussed the first three sections of the streaming payout model: revenue (which is up to the streaming services and users), royalty payments (regulators and the streaming services) and payment structures (streaming services and labels). In many ways, the remaining function, label payouts, is the most pressing problem – especially where streaming is concerned. The figures quoted by artists when criticizing the “unlivable” royalties paid out by streaming services, for example, are after their labels take their share. Though the dataset is limited to France, Ernst & Young reported that Spotify and Deezer retained only 21% of gross revenue last year. Labels took home more than twice that amount – and nearly three times as much as artists, songwriters and publishers combined. Put another way, labels retained 73 of every 100 cents paid out by Spotify and Deezer, while the tens of thousands of artists and songwriters collected only 11 and 16 cents, respectively. One could argue the distribution is even more skewed than payout rates suggest, as Sony, Warner and Universal own a reported 25% of Spotify. Today, that stake is worth more than $2B (up from $1B in Q4 2013) – a sum that nearly matches the total value of all royalties paid by Spotify to date – and will be retained in its entirety by the three labels. In 2013, Macklemore became the first unsigned artist in nearly 20 years to have a number-one single in the United States, “Thrift Shop”. The track was a grassroots success story born on social music sites such as SoundCloud and Hype Machine, rather than in state of the art studios and ad agency lofts. And if “Thrift Shop” didn’t scare music labels, Macklemore quickly gave them a second reason to be. Three months later, he proved he was no “one hit wonder” with another chart topper: “Can’t Hold Us”. A third track, “Same Love” hit #11 shortly thereafter. Macklemore’s success doesn’t mean that music studios and labels don’t add value. Breaking out of obscurity – let alone to Macklemore’s newfound fame – remains exceedingly difficult. “Thrift Shop” was actually the fifth single from his album “The Heist”, which was released more than 18 months before the single appeared on the Billboard charts. But if obscure artists can have a multiplatinum record without label support, what must the Katy Perrys and U2s of the world be thinking? Artists typically receive less than 15% of the revenue from an iTunes sale (after Apple’s 30% distribution cut), with the rest going to the record label and to a lesser extent, songwriters. U2 is a large operation, to be sure, but they’re also a reliable and routine one. Rather than hand over usurious portions of their music sales to a record company, why can’t they pay salaried team to manage their concert tours, contracts, studio sessions and retail distribution (the last of which Macklemore hired Warner Music Group for)? Many of the more complex studio responsibilities, such as retail negotiations and managing manufacturing and fulfillment contracts, are quickly becoming anachronisms in the age of digital distribution and flat prices. The need for changes in the artist-label contract isn’t new. But with revenue down more than 70% and an unprecedented number of artists competing for the remainder, the business can no longer afford the financial structures of yesteryear. Indeed, this is why many believe Spotify will begin signing artists directly, disintermediating labels just as Netflix has done to television networks. At the same time, artists must recognize that “better” revenue shares or direct-to-streaming-service deals may bring about reductions (much-loved) contract advances. Music, itself, may be commoditizing – but as concerts have shown, there are opportunities to expand musical content into new experiences and products. Last year, Deadmau5 launched a paid app ($5/month or $50/year) that gives subscribers access to exclusive music, videos and intimate behind-the-scenes reports. Taylor Swift took on a role as New York City’s official global brand ambassador and served as a one-time Victoria’s Secret Angel. Private performances and Las Vegas residencies have also become more popular and lucrative in recent years. In 2011, for example, Jay Z and Kanye West were paid $3M each for a private show in Dubai. Though their ultimate share of this revenue is private, it would have taken 500,000 albums (enough for gold certification) or a 5x platinum single to match this topline. A number of celebrity musicians have even parlayed their fame into significant cross-industry successes, from clothing to beverages, venture investing and sports franchises. This type of brand extension dominates the video and news industry today. The core product is transformed from a profit center into a platform or brand upon which additional products can be sold, be it theme parks or wine tours. Even still, compressed economics tend to make cost structure a key competitive advantage. Those willing and able to survive on less revenue tend to be fine – and in many cases can establish an empire (e.g. Maker or BuzzFeed). For those who grew in an era of plentiful consumer spend and limited competition, this transition is tough, but for indies – many of whom gave away free CDs to drive awareness – the playing field has become more level. 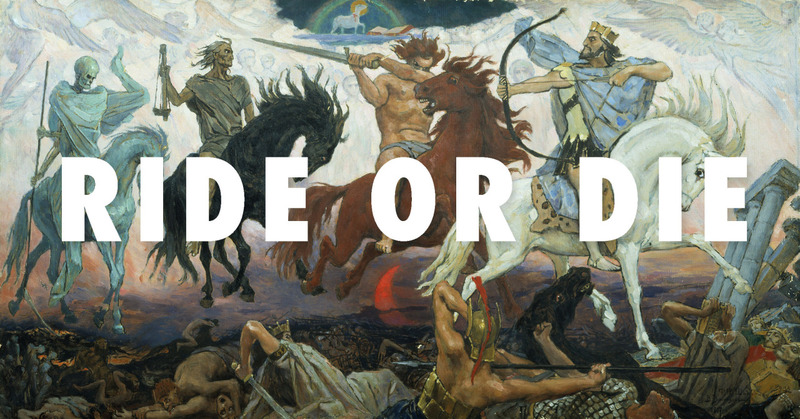 The role of music in modern civilization is hard to overstate. Music punctuates our daily life, crosses cultural and national boundaries with ease and is unmatched in its ability to transform our mood or transport us decades into the past. The idea that the category is losing value is tragic, whatever the cause. Yet the decline, which began long before the emergence of ad-based or subscription streaming models, doesn’t need to be terminal. Services such as Spotify, Pandora and Tidal have the opportunity to reverse 15 years of declining consumer spend and B2B revenue. Their models will likely need to evolve, but most key metrics continue to improve even as the major services have scaled their user bases. However, many musicians – especially those sitting atop the industry today – will need to come to terms with the fact that their music could be worth less than they believed and that they’ll need to find new revenue opportunities outside the recording studio. This outcome is far from unique – it’s affecting publishing, gaming, television and film. Most importantly, however, artists must recognize that without new label agreements, their tide will never turn. One could argue that news/journalism should hold this title. Which is largely fair, though I’d argue that news readers tend to be more distinguishing – if music sounds good, most don’t worry about the composition, arrangement, style, biases, label, etc. Journalism is consumed a little differently, though, ultimately, the relative rank isn’t essential to my argument. Though this claim seems controversial, it’s actually rather absurd to assume that there aren’t millions of artists making terrific music each year. The problem is discovery, not talent.